Conference Facilities South Africa has a comprehensive list of conference venues and centres with conference facilities in the Hantam & Upper Karoo region of the Northern Cape Province in South Africa. The Hantam and Upper Karoo region of the Northern Cape in South Africa is bounded on three sides by provincial boundaries and the Orange River. The region is renowned for its unpolluted skies making it the perfect setting for South Africa's Astronomical Observatory. 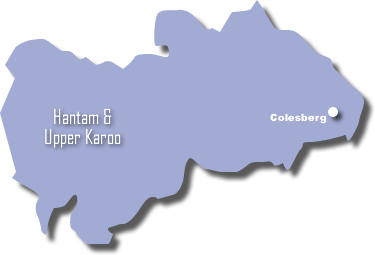 The Hantam and Upper Karoo region is characterised by wide-open plains interspersed with rugged mountains and koppies. The area is also rich with wild life and flora with a number of recognized 4x4 trails situated throughout the region. Some 250 million years ago the Hantam and Upper Karoo region of the Northern Cape was an inland sea. Today the fossilised prints of dinosaurs are found in the area and nature reserves with game birdlife and unusual vegetation abound in the region. In this region you will find Calvinia, one of the largest wool-producing districts in South Africa. Here you can visit the Calvinia Museum which focuses on farming, transport and the lifestyle of the early inhabitants. The Hantam and Upper Karoo region town of Nieuwoudtville is known for its unique vegetation and for the Nieuwoudtville Falls situated on the Doring River. The Oorlogskloof Nature Reserve situated only 10km south of Nieuwoudtville, offers hiking trails and bird watching opportunities. The biggest town of the Upper Karoo region of the Northern Cape is De Aar. The town is an important rail junction for Johannesburg, Cape Town, Port Elizabeth and Namibia. Hanover is situated a few kilometers to the East of De Aar. Hanover was established in 1854 on a farm belonging to a man called Gous and named after one of his ancestors. The Hantam and Upper Karoo town of Victoria West gets its name from Queen Victoria and is wedged between two mountains and the Ongers River. The town is on the watershed between the West and East coasts of South Africa. To the South of the town is the small Victoria West Nature Reserve.